Do Zombies go to the Bathroom? | We Zombie! Do Zombies go to the Bathroom? 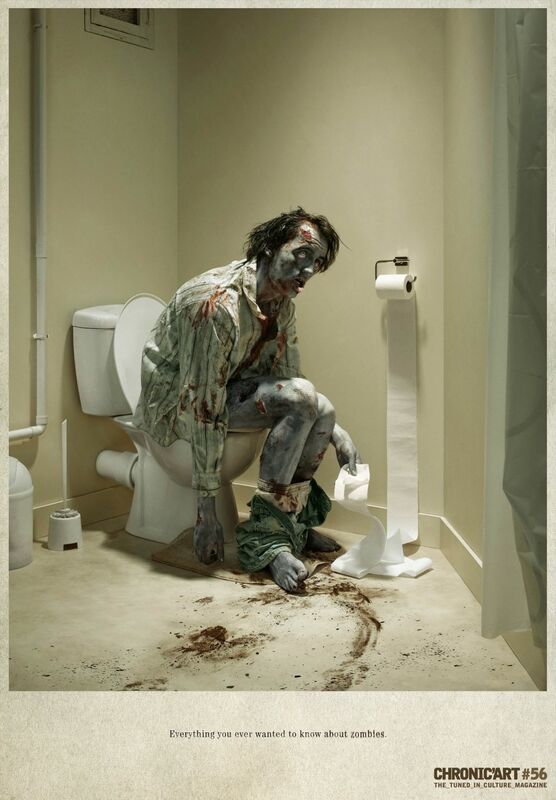 I was over at the Zombie Research Society‘s blog today and ran across this image they were commenting on, linking to their story about how zombies digest food, called “Do Zombies Really Eat People?“. The image comes from a French magazine called Chronic ‘art, issue #56. For me, this is one of the greatest zombie pics I’ve seen in a long time. Obviously this is a “living zombie” rather than the “living dead” zombie. When I saw the comment on the ZRS post, “Imagine how this might smell?” it got me to thinking about other captions that might go along with the picture, like “Think you’ve had a bad day?” or “Damnit kids, I’m trying to go to the bathroom!“. Help us think of a great caption for this picture. Post a comment with your caption, and you’ll have a chance to win a free book. After seven days, I’ll randomly select one of the posts and send the author of the post a free copy of Matt Mogk’s new book “Everything You Ever Wanted To Know About Zombies.” Matt is one of the founders of the Zombie Research Society and his new book is a fantastic primer on zombies – perfect for you to give as a gift to those folks who give you that blank look when you start talking about zombies. 7 Responses to Do Zombies go to the Bathroom? Congratulations to Amy- she has won a copy of Matt Mogk’s new book, Everything You Ever Wanted to Know About Zombies! That Thai I had for lunch was hot!